Our boat, the Preservation, formerly the Wreck Diver, is our single largest project in both work and capital invested that GLSPS has undertaken. 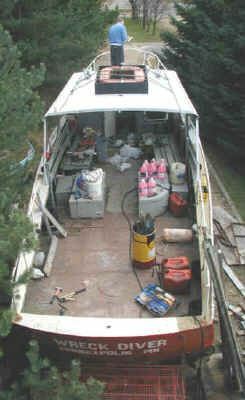 We acquired it in September of 2001 as a donation from Jay Chester and have been working on it weekly since September 2001 to remodel it as a work boat for GLSPS. The Wreck Diver was a 28 foot steel hull excursion boat with a commercial rating. 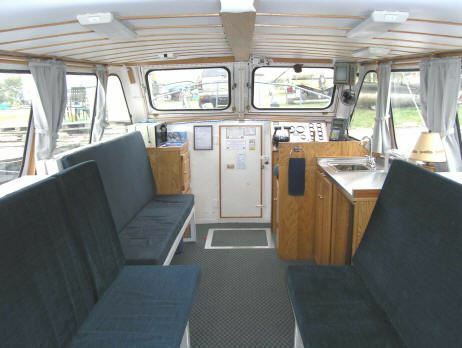 It sports a large back deck and open back cabin and is powered by two efficient diesel engines. 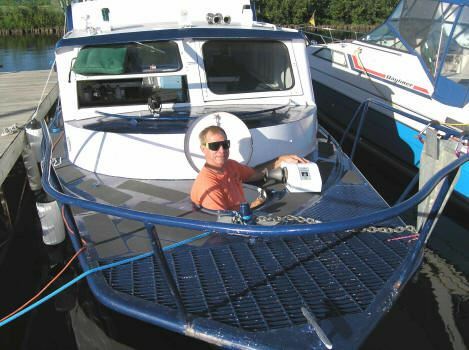 It is a sturdy hull and should be relatively inexpensive to operate. Our plan is to use it for Lake Superior GLSPS projects such as setting moorings, carrying out our monitoring program, and supporting preservation and documentation projects. 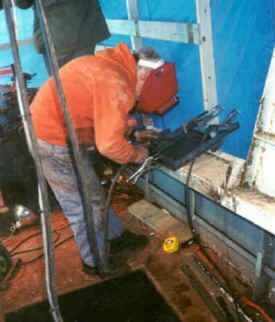 Our original hope was to install an overhead lifting frame so we could transport and place the one-ton concrete mooring blocks we use for our mooring projects. After some rough calculations we are less certain that we could maneuver blocks of that size in and out of the boat. With our newly invented mooring approach of drilling into the rock lake bottom and using anchor bolts instead of mooring blocks, we won't need the lifting frame and we will still be able to install moorings. The work started with a new deck plan by Steve Daniel. The helm and galley are on the starboard side. Bunks/seats run lengthwise on both sides of a center aisle. The head and storage are in the bow. After a major re-modeling and re-fitting effort and six long years of work we finally launched the Preservation in 2007. 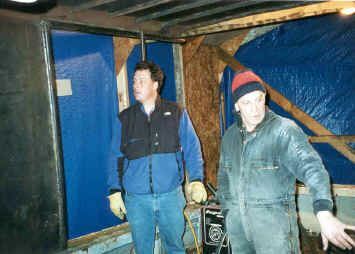 Initially we built a temporary boat house to cover the boat so we could work year around. We added a raised and extended cabin roof over the back deck so we can work in the rain and enclosed the cabin. Since most of the projects will be weekends we added sleeping accommodations for six and a simple galley for lunches underway. After two years of working on the boat we discovered there was severe pitting on the bottom of the hull so we removed and re-plated three quarters of the bottom steel. 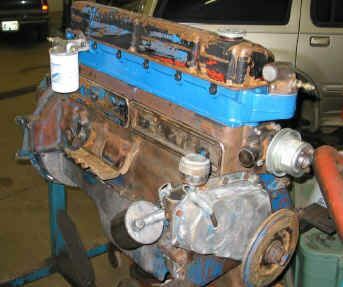 Engines and transmissions were rebuilt and overhauled. 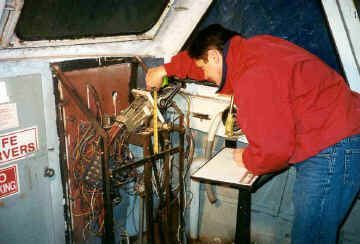 We replaced the prop shafts and seals, the marine head, the helm, some electronics, and or course stripped and repainted the hull. We then moved the boat to Spirit Lake Marina in Duluth where we continued the work. We are now done and the final product is shown in the photos below - along with photos of the work it took to get us there. 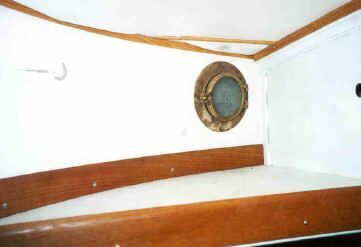 We now have a busy schedule of shipwreck projects we plan to do using the newly outfitted Preservation. 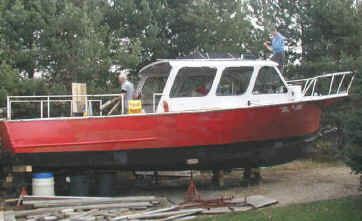 Much has been accomplished in renovating the new GLSPS workboat, Preservation. Volunteer work commenced as soon as the winter holidays passed and the weather warmed up a bit. Steve Daniel provided a drawing to help the crews design and engineer an extension to the cabin. Ken Merryman and Bob Olson removed the rudders, propellers and prop shafts to enable removal of the engines. 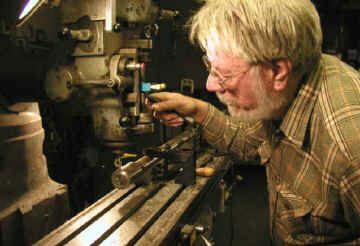 Bob Olson crafted a custom hoist to lift the engines for examination and refurbishment. 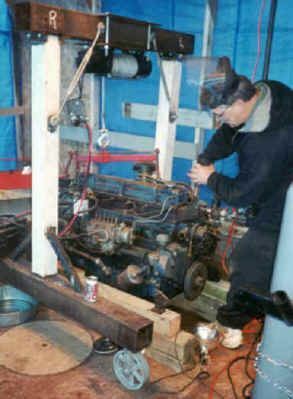 He removed the transmission from the starboard engine and is replacing some of the gears. 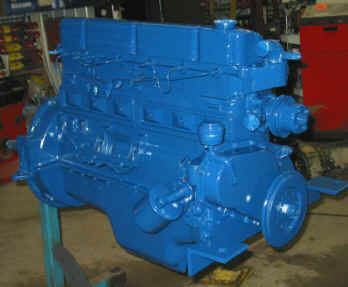 The port engine will undergo needed work to bring it back to smooth operating condition. New stainless steel shafts and new coupling boxes will be purchased to help reduce leaking that occurred during previous operation of the boat. Bob also welded reinforcement on the starboard rudder steering structure. Ken Merryman and Bob Nelson enrolled in welding classes to learn skills that will help in the construction of the steel cabin extension. Ken fabricated the curved sidepieces from 12-inch pipe and fitted them in place to match the contour of the original cabin roof. 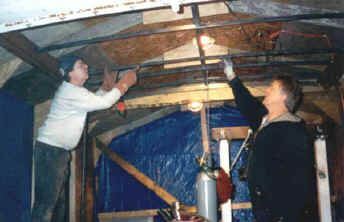 Ken, Tom Brueshaber, Todd Olson and Bob Olson positioned the roof cross ribs and tack-welded them in place. The next step will be to weld the thin wide steel sheets to form the roof covering. A dinghy donated by RLT Divers will later be placed on top prior to launch. 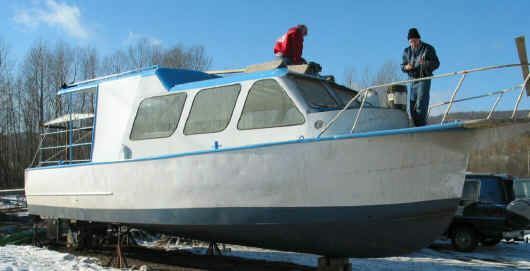 Ron Johnson and Todd Olson removed the old bulkhead and small storage compartment from the forward cabin. They removed the toilet for cleaning and refurbishment. 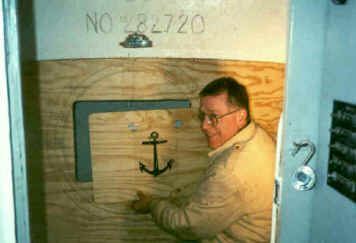 They also cleaned out the watertight compartments of debris that had accumulated over the years. Floor supports and planks will be added to the center of each compartment for easy inspection during future operations of the boat. Steve Daniel is coordinating the redesign of the head and forward storage compartments. 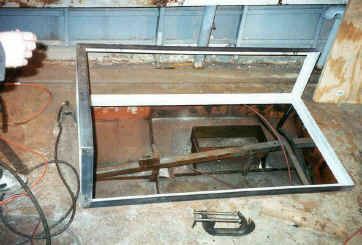 A new bulkhead for the anchor line locker was measured, and fitted to the hull. Metal bracing for the floor and storage cabinets was added or reinforced to secure new woodwork by Bob Olson. 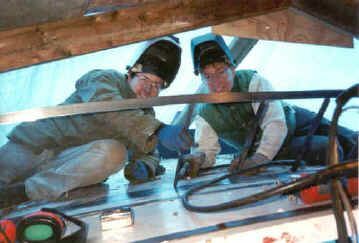 Bob also welded a new step in place for easier egress in and out of the forward cabin. A new floor was cut from 5/4 plywood and fitted to provide a firm base. 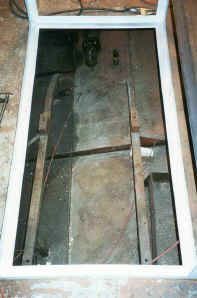 The floor is removable to allow access to the bilge pump below. 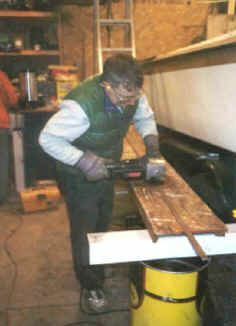 Steve cut and fitted various sections of plywood to form new storage cabinets on the port and starboard sides of the forward cabin. 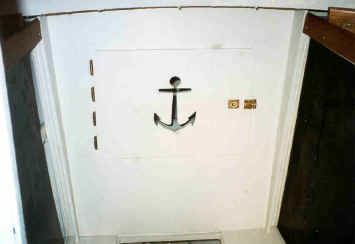 A door opening to the anchor line locker was made for easy access in addition to the hatch in the deck above. Sliding doors will be made to fit the front of both storage areas. Plastic containers were purchased and donated for use in keeping items neatly stowed. Tom Brueshaber provided helpful suggestions for fit and finish of the cabinets. 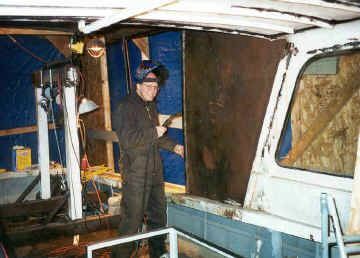 Ron Johnson used a sandblaster to remove rust from several areas of the forward cabin. Bob Olson primed the metal areas and the wood sections of the storage cabinets. Much remains to be done on the cabin interior. A drawing was made by Steve Daniel to assist the work crews in refitting the interior of the boat. A new plywood wall will be added to the rear of the cabin extension. A door with windows on each side will be included. Bunks will be added with storage bins underneath for personal gear. Materials to reduce sound and vibration from the engines were donated by 3M Company. These will help the captain hear the marine radio more easily as well as provide a more comfortable interior for the crew. 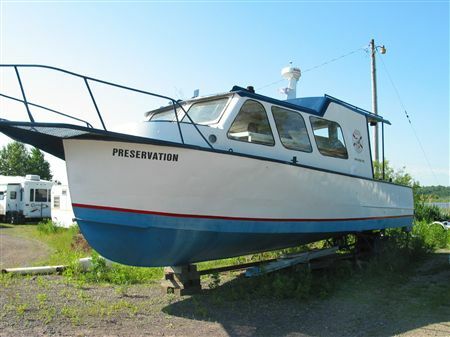 Volunteers are needed as the weather warms to help remove paint from the hull. Supplies consisting of respirators, safety goggles, paint removal disks, sanding disks and other materials were donated by 3M to the GLSPS to help with this task. Marine paint will be purchased to prime and seal the metal surfaces. Please contact Bob Olson to schedule a time that you are interested in helping. The following is the list of jobs that must be completed before launch. The boat is coming together rapidly now. Members, if you see something you can do to help, we will resume boat work in the spring. 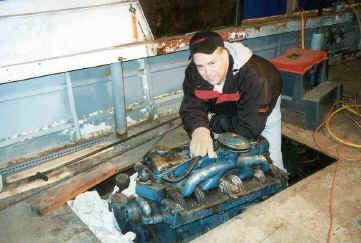 The engine and transmission work will be done over the winter. Jump in and give a hand. The following is the list of jobs that must be completed before launch. The boat is coming together rapidly now. 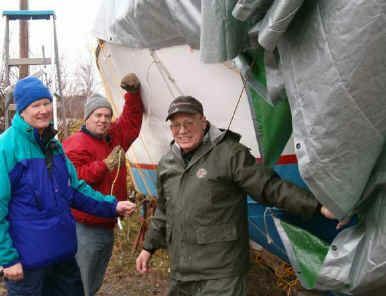 Members, if you see something you can do to help, we will resume boat work in the spring. Jump in and give a hand. 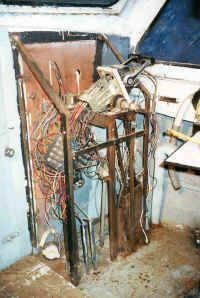 Run all new wiring in bilge, run all new fuel lines and dual filtering systems, all engine, transmission and heat exchanger cooling system plumbing and anode system, prop seal system, anything in the Engine bilge.